I was in the mood for another take on the Zombie Apocalypse, so I picked up Apocalypse Z: The Beginning of the End by Manel Loureiro (a Spanish practicing lawyer & author based in Pontevedra, Spain). With an average of 4.2 out of 5 stars on Amazon (and 1,083 5 star reviews! ), I figured this should be a good buy. The main character in the book is a yuppie lawyer who initially starts blogging as a way of dealing with his grief after the death of his wife, and ended up chronicling his harrowing experiences in a personal journal during the Zombie apocalypse. I thought that the blogging style worked well in the beginning, when the lawyer was slowly waking up to the real threat while trying to go about his ordinary life (going to work, shopping, etc). I was still okay when it got switched to writing a journal (the internet dies during the apocalypse, y’all) – after all, the guy was stuck alone in his home surrounded by zombies. Plenty of time to write one’s thoughts down on paper. Personally, if the author was really dead set on the journal aspect, I thought the character should’ve just remained stuck in his home, while he fought going cabin-fever crazy while trying to figure out a way to survive the Zombies. Less travelling / adventuring / gathering companions (including a possible love-interest character whose age – 16/17? – gave me the creeps), and more going into the psychology of survival of a lone wolf-type character maybe. 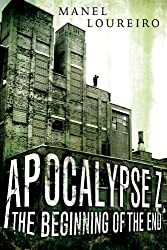 Apocalypse Z: The Beginning of the End by Manel Loureiro, translated by Pamela Carmell (AmazonCrossing) is available on Amazon. Really nice review! More so the writing style, very easy to actually want to click on your blog and read 🙂 I real the zombie genre is exhausted now and I may steer clear of this 😛 World War Z was fantastic.